Syria, After the War – Patrick F. Clarkin, Ph.D.
For the internally displaced, an estimated 4.6 million people live in places beyond the reach of relief efforts, and close to half a million live in areas under siege. Several studies have indicated that exposure to nutritional deprivation and other forms of stress during war early in life (prenatally and in infancy) can have long-term consequences on health later in life, for those who survive. Perhaps the best known case is the Dutch Hunger Winter during World War 2. 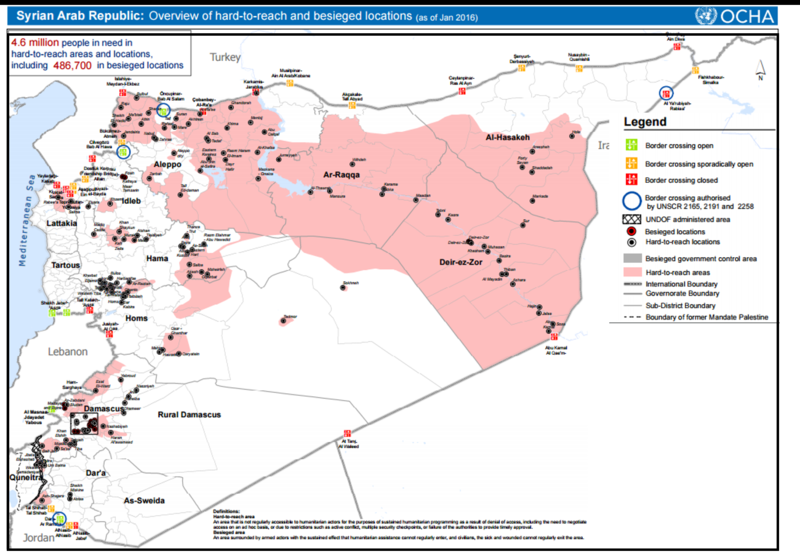 Map showing areas of Syria under siege and beyond reach of relief efforts, as of Jan 2016. Source: Reliefweb. In the Netherlands, adults who were exposed to a Nazi-imposed siege while in utero grew up to have elevated risk for schizophrenia, depression, coronary heart disease, and type 2 diabetes (Roseboom et al 2011). They were also more responsive to stress and performed worse on cognitive tasks. Other cases show similar long-term effects, including the siege of Leningrad (Stanner et al 1997; Rotar et al 2015), the Biafran famine during the Nigerian civil war (Hult et al 2010), the Spanish Civil War (Gonzalez Zapata ett al 2006). Additionally, Hmong refugees born in war-torn areas in Laos during the Second Indochina War (aka, “The Secret War”) grew up to be shorter and have more body fat than their counterparts born in safer areas (Clarkin 2008). Of course, this list is not complete. The findings from all of these cases are idiosyncratic, varying in magnitude and depending upon the timing of exposure to war. Collectively, however, they suggest that war’s effects on health can last for decades in subtle ways that go beyond those that are better known and more easily seen, such as physical injuries and PTSD. There is very high likelihood that even if the war in Syria ended tomorrow, the biological effects will last for a long time to come (see Devakumar et al 2015). Even beyond the biological effects, the physical destruction of Syria’s infrastructure has been jaw-dropping. Photos on the ground and drone videos from above reveal extensive devastation that it is difficult to grasp how long it would take to rebuild. Other things have been broken as well: families, trust, social order, education, the economy. Of course, the longer it goes on, the more damage that is done, the longer it will take to attempt to return to normal. This entry was posted in DOHaD, Stress, Trauma, War and health and tagged Syria. Bookmark the permalink.